Okay, today’s strip is a bit gross, I have to admit. In fact, a couple of magazines rejected it, when we sent it out. But it’s not like airsickness wouldn’t be a real thing. In fact, I personally suffer from motion sickness ever since I was a kid. In fact, the part of throwing up on the mic boom is not invented and something that I may have subjected my brother to when he took me for a flight in a motor glider many years back. It’s gotten better, especially in cars, but put me on a small boat or airplane and chances are I get sick. I’ve been told that you get rid of motion sickness in airplanes once you start flying yourself. That may well be true, because it certainly was that way for me with cars. So I guess all I need to do is to learn to fly! In fact, we put that in as one of our goals on our Patreon page! When we reach a certain level of support, I vow to overcome all my anxieties and airsickness and get a PPL! We’re still pretty far off that goal yet. But we do already have 27 patrons! Thank you guys and gals, you’re awesome!! Our first little film is coming along nicely, by the way, albeit slowly. But it looks like we’ll be able to keep our schedule and get it done in time for AERO in April. Oh, yeah, that’s another thing we wanted to mention: We’ll be at the AERO expo in Friedrichshafen again this year! Foyer Ost, as usual. More details to follow! 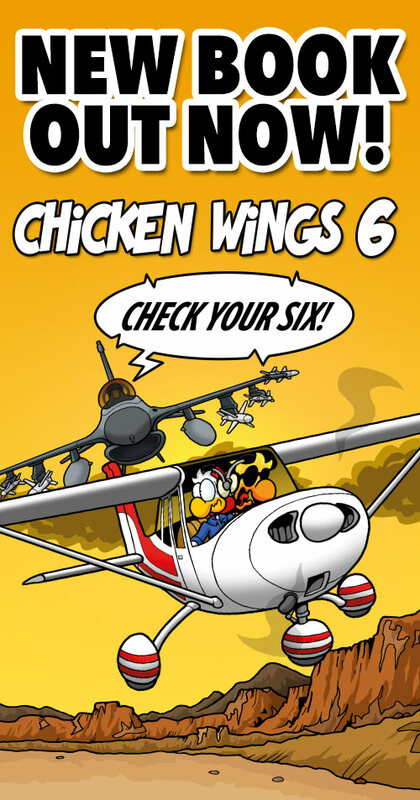 Enjoy Chickenwings weekly here in New Zeaalnd. Yup, sick passengers is basically just a fact of life for pilots that do introductory flights in light aircraft. It’s not pleasant, you try to avoid it, but sooner or later someone is going to fill the bag you discretely pointed out as a “trashbag” during the pre-flight briefing. It’s especially noticeable on gliders, since their long slender wings makes them more sensitive to picking up any turbulence. The circling in thermals doesn’t help either if people don’t keep looking outside. Unfortunately the worse they feel the more they tend to keep their gaze inside the aircraft.